Have you ever seen the guy on the Food Network; the one with the spikey blonde hair? You know the one, he’s got that show about the dives…the diners…and something something….yeah, that guy. Anyway, our family enjoys watching his show and checking out all the different and interesting eateries he finds around the country. In one particular episode, our intrepid adventurer was checking out BBQ joints out west. And in this one episode, the owner of one of these places was putting meatloafs on his smoker. My wife and I looked at each other in astonishment. How come we’ve never heard of this before? It’s a marriage made in heaven: smoke, meat. What could be better? Ever since I saw that episode, I knew I wasn’t going to find something like this at any of the local joints so I knew I was going to have to try making this myself. This past weekend, I finally got around to making it happen. 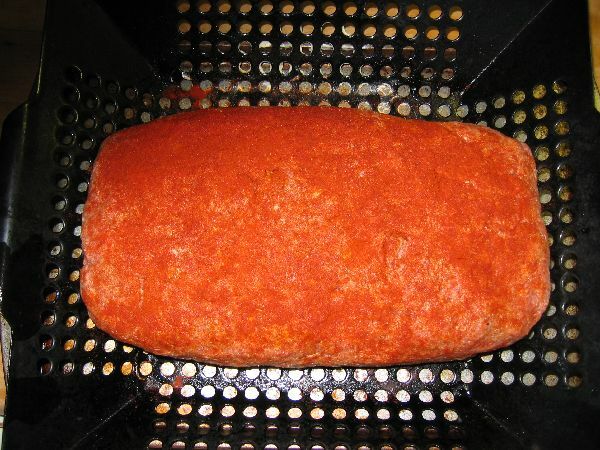 The idea was simple, just take a normal meatloaf and throw it on the smoker. Right? That’s the wonderful thing about BBQ: marvelous things can come from such simple beginnings. 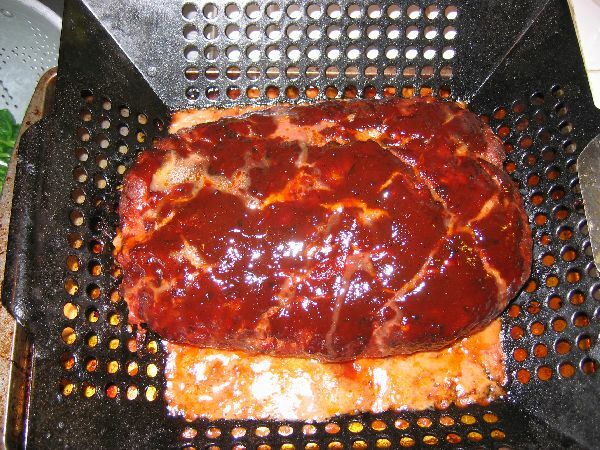 Rather than reinvent the wheel I decided to go online and read up on smoking a meatloaf at one of my favorite BBQ webites, The Virtual Weber Bullet. Mix gently and form into a 9″x6″x2″ loaf. One of the keys here is that you don’t want to put this into any kind of pan that will retain all the fat drippings so I used my grill wok to place the meat on. This allows all the fat to drip away. I heated the WSM to about 300*, placed a temp probe into the meat, put the loaf on the top rack, closed the lid and walked away for an hour. You may notice that I seasoned the top of the meatloaf with paprika, but this was really unnecessary as it doesn’t impart any flavor to the meat and as you’ll see in a bit, the sauce I poured on top completely covers it, so there’s no benefit for presentation. After roughly an hour, the internal temp of the meat was at 100*. 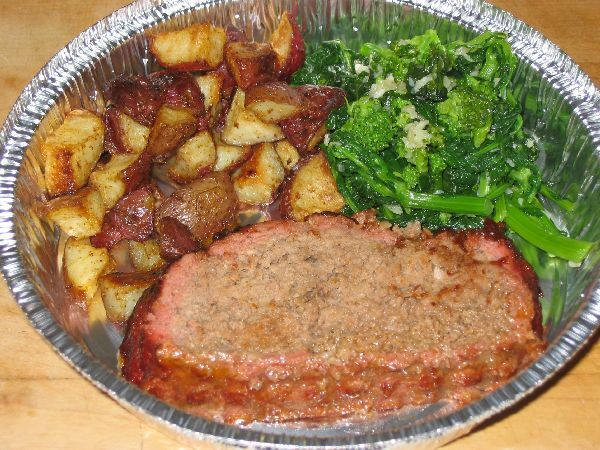 I had made my own sauce that is a variation of what we usually put on top of a meatloaf. 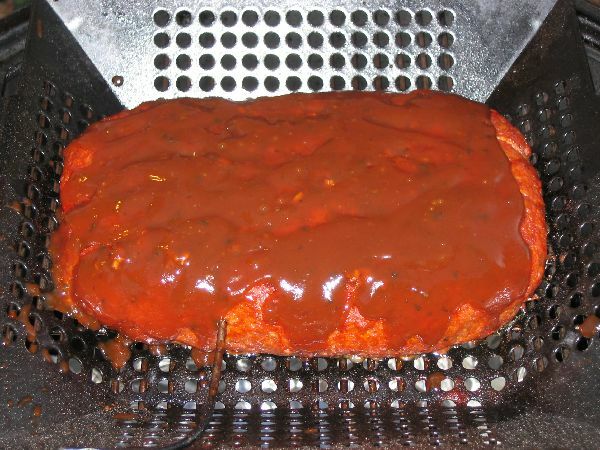 The recipe consits of about 1 part A1 Sauce and 1 part water to 5 parts ketchup. I mixed all of this together in a squeeze bottle, filling it nearly to the top so I don’t know the measurement, but I then added about 1 tablespoon of molasses to the mixure to give a bit of sweetness. At the 100* mark, I scored the meat in a diamond pattern and squirted the sauce on top of the meat. I closed the lid again and let the meatloaf cook to about 160*. Now a funny thing happened on the way to that 160*. It didn’t quite make it on the smoker. This recipe called for about 1.5 to 2 hours to cook at 300-350*, but as in all things slow and low, temperatures can conspire against you real quick. And that’s exactly what happened here. Temps started creeping below 300* real quick and settled in around 275. Much too low to get dinner on in time. There was a hungry family waiting for my experiment to feed them and it was getting late, so I got as far as 135* and had to finish it off in a 350* oven for about the last 20 minutes. Since I couldn’t exactly let the grease drippings fall to the bottom of my stove, I had to put the grill wok on top of a cookie sheet. So don’t let the puddle of nasty yellow beef fat at the bottom of the pan fool ya, we’ll just discard that later. As you can see, the smoker added a nice smoke ring around the outer edges of the meat. The meat itself inside was considerably moist considering we let all the fat drip away. I suppose this was a result of the added moisture from the milk and ketchup mixed into the meat. So, how was it? 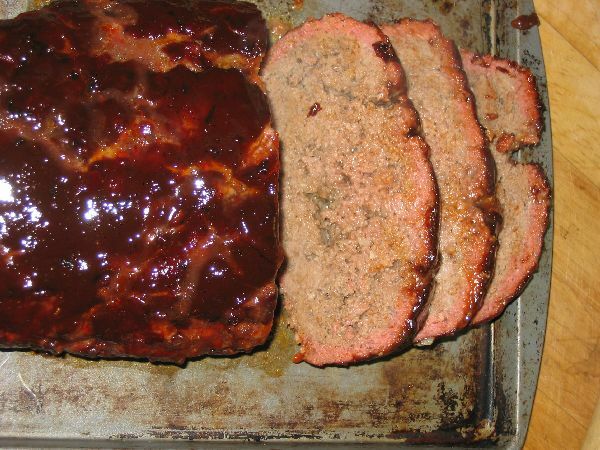 For me, I thought it was incredible and now I can’t imagine having meatloaf any other way. Even my daughter, who normally doesn’t like meatloaf, enjoyed it. I didn’t get a chance to take a picture of our dinner plates since I had, well….hungry people to feed. But here’s a shot of the meal some lucky person will get. Our church takes meal donations, so we can take leftovers from a large meal, place them in a takeout container and freeze them and they will give these out to needy families or parishioners. This entry was posted in Cooking Blogs. Bookmark the permalink.